HONOLULU – The Polynesian voyaging canoe that recently completed a 3,500-mile trek across the Atlantic Ocean is now on its way to the Caribbean. The Honolulu Star-Advertiser reports that the Hokulea left Brazil Friday for the next part of its around-the-world journey. The crew is expecting an 18-day, 2,400-mile trip to the island of St. John in the Virgin Islands. The double-hulled canoe left Hawaii last year, and its crew members are sailing without modern navigation equipment. Along their three-year journey they are stopping to teach people in other countries about traditional navigation, Native Hawaiian culture and caring for the ocean. Guth is the chief operating officer for the Polynesian Voyaging Society, which is leading the Hokulea’s three-year journey and aims to provide environmental stewardship and cultural harmony. She typically deals with logistics and other behind-the-scenes details. She says the tight-knit Caribbean island community is working to protect natural resources and rediscovering its indigenous identity. On Valentine’s Day, there were 12 people who are oceans away from their loved ones, but they are taking care of each other, they’re a canoe family living on the 42-foot by ten-foot deck of Hawaii’s voyaging canoe Hokulea. The team bid aloha to Brazil earlier this week, and in about two more weeks will be arriving in St. John. The crew is made of 11 men, one woman, from Oahu, Molokai, Maui and Hawaii islands. They’re on every one of Hokulea’s long-distance deep-sea voyages, creating a quiet start to this 17th leg of malama honua, the voyage around the world, and captain Kalepa Baybayan says it’s fitting. “It’s a nice start because it’s very very comfortable, it’s very pleasant the winds aren’t too strong, the seas are relatively very small so it’s flat conditions,” Baybayan said. And there’s a comforting familiarity even here, where these experienced crew members and Hokulea have never sailed before. After St. John, the Hokulea plans to continue up the U.S. East Coast for the first time in its 40-year history. The schedule includes stops in Newport News, Virginia; Washington, D.C.; and New York. The double-hulled canoe left Hawaii in 2013, and its crew members are sailing without modern navigation equipment. The Hawaiian crew sailing a traditional Polynesian voyaging canoe around the world to raise environmental awareness is in Hampton Roads this week to advance plans to sail to Newport News in April. Then on Saturday, the museum says it plans an SOL-based Hokule’a Cultural and Environmental Teacher Professional Development Day. 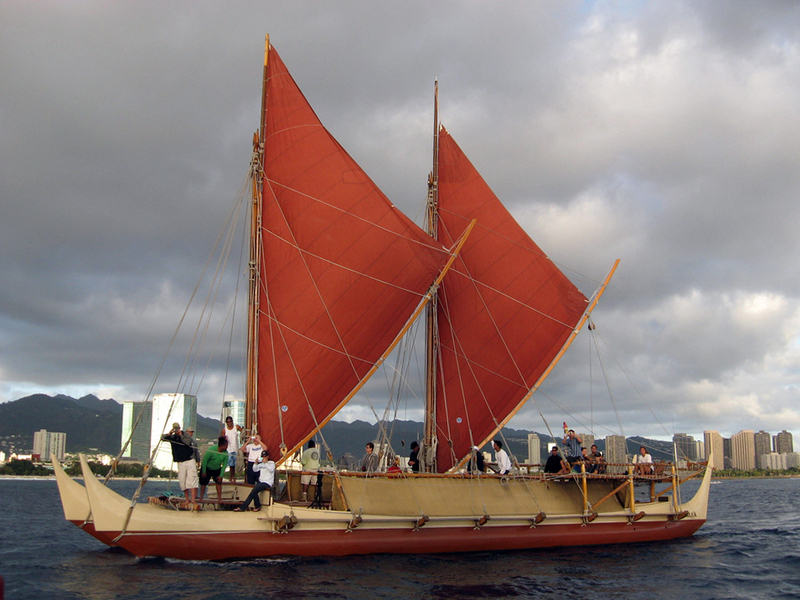 Hokule’a is the name of the 62-foot, 8-ton, double-hulled sailing canoe, which is still off the coast of Brazil. This type of vessel was once used by native peoples to sail among the Pacific islands across vast distances using the sun, stars and wind to navigate, said Nainoa Thompson, educator and head of the Polynesian Voyaging Society. But the ancient navigational skills and canoe-building techniques were lost for more than 600 years before the society built the Hokule’a in the 1970s. Now it’s on a 45,000-mile, three-year mission to navigate the globe. The canoe has already traveled about 28,000 miles under 192 total crew members who have changed out 18 times, he said. They’ve visited 14 countries and 85 ports. The Hokule’a is expected to sail into Hampton Roads on April 22, and be escorted to the James River Fishing Pier in Newport News by a local flotilla, museum officials said. On April 24, the ship is scheduled to sail to Yorktown for a traditional welcoming ceremony. It’s expected to depart the area May 7. “It is a great opportunity to learn of another important maritime culture,” said Lyles Forbes, the museum’s vice president of collections. The group left Hawaii in 2013 and is expected to conclude its journey in June of 2017.